Interested in innovation, setting a new standard and seeing your visions come to reality? We are the destination of choice for many of the architectural industry's search for premier casework solutions. From initial bid specifications to final delivery of the cabinetry you seek. Always on the lookout for a way to raise the bar, let us help you attain design elements you've only dreamed of in the past. Never satisfied with "good enough", our cabinet shop located in South Hackensack New Jersey, is always under improvement, utilizing the very latest technology in woodworking machinery and computer programs for everything from design to production, enabling Salon Interiors to be on the forefront of today's demands for cutting edge commercial casework. 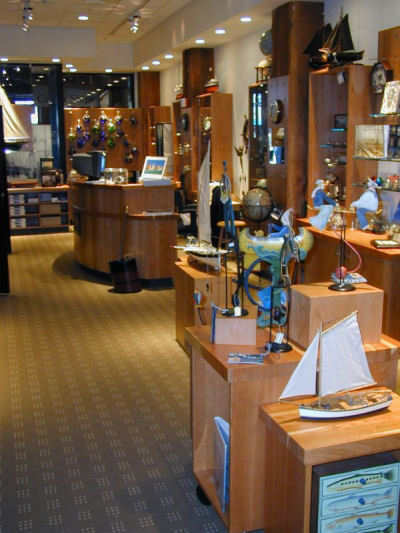 Whether you want to advance a new idea in product display for retail applications and capture people's attention with your designs, ensure your success with Salon Interiors and our experience of over a quarter century in the commercial design industry, focusing on cabinet production and commercial casework. We can provide Cut To Size services, ensuring consistently measured project components. If you require detailed and exact cutting templates for your business, Salon Interiors can help you with our Template Service. Our table tops are custom made in a wide variety of shapes, materials, and sizes. We can supply laminates, or use yours for completion of a larger job. Tops can be self edged or edge banded. There really isn't a more effective and time efficient way to mass produce your table tops order.